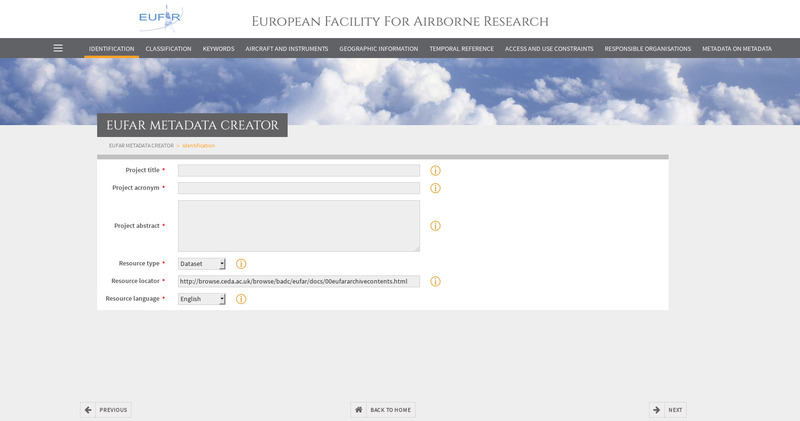 To facilitate airborne research measurements, a number of EUFAR’s activities are dedicated to developing and maintaining a range of toolboxes that serve to assist operators and researchers with the handling of data. From in-situ or remote sensing data collection to data processing, analysis and archiving, these toolboxes are made freely accessible on or via the EUFAR website and are documented in user manuals. The Standards and Protocols (S&P) activity aims to efficiently integrate data in the EUFAR database and ensure its interoperability with other standards by developing and updating open-source data processing toolboxes. The activity also keeps track of existing open-source toolboxes, which would be relevant for operators and users within EUFAR. For example, the S&P team proposes a set of tools dedicated to the processing of in-situ data (EGADS) and the creation of INSPIRE compliant metadata for in-situ and hyperspectral data (EMC and ASMM). Through the Database activity, data from EUFAR transnational access campaigns are stored and made widely accessible online through a single gateway, with a search tool to facilitate locating specific data (EFF). In addition, data are stored in community compliant data formats with well-documented supporting metadata. Toolboxes are also developed as part of EUFAR’s Education & Training activity with the aim to familiarise and assist early researchers participating in training courses with the different aspects of airborne research for the environment. EUFAR’s Joint Research Activities are dedicated to developing methodologies and tools for the integrated use of airborne hyperspectral imaging and airborne laser scanning data (HYLIGHT and HYSOMA). The goal of the EUFAR Metadata Creator is to produce metadata (conform to INSPIRE standards) to facilitate data storage and searches for Airborne Scientific Campaigns. EGADS is a Python-based toolbox for processing airborne atmospheric data. It provides a framework for researchers to apply expert-contributed algorithms to data files, and acts as a platform for data intercomparison. EFF is a geospatial-temporal search interface to locate EUFAR data within the EUFAR data archive at BADC. The aim of the EFF is to facilitate the location and identification of EUFAR flights and to link to the appropriate data files in the archive. This project was motivated by the need to create a standard set of mission reports, aiding in classification and searches of data sets based on flight phenomena, mission parameters or other criteria. More information is available in the Research section of the website, or following this link: JRA1 - HYLIGHT. Hands-on lesson and data for vegetation studies with pktools (SWAMP). HYSOMA is an experimental platform for soil mapping applications of hyperspectral imagery that allows easy implementation in the hyperspectral and non-hyperspectral communities (distribution under the idl-virtual machine) and gives the choice of multiple algorithms for each soil parameter. The main motivation for HYSOMA development is to provide experts and non-expert users with a suite of tools that can be used for soil applications. Hands-on lesson for airborne measurements in atmospheric science: focus on turbulence and clouds (TETRAD). This is a compilation of available free software tools dealing with the analysis of remote sensing data, and hyperspectral data in particular. An online course for PhD students and early stage researchers developed by Dr Alasdair Mac Arthur (NCEO-FSF, U. of Edinburgh), Dr Gary Llewellyn (BAS NARF), Mr Ben Taylor (NARF-DAN-PML), Dr Jose Gormez-Dans (NCEO-UCL), Prof. Martin Wooster (NCEO-KCL). to run various retrieval toolboxes (parametric, non-parametric, LUT-based inversion) to map biophysical variables.